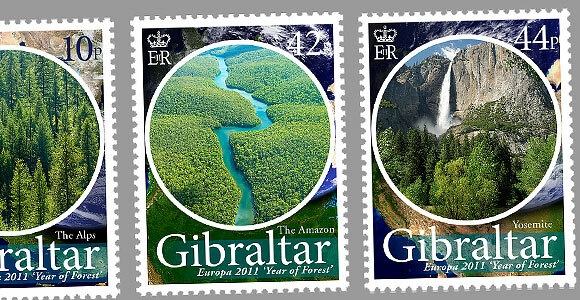 The stamps depict forests found in the Amazon, Brazil; Yosemite National Park in California, North America; Alpine forests and forests found in Plitvice Lakes National Park in Croatia. The Amazon Rainforest, Brazil, South America is a moist broadleaf forest that covers most of the Amazon Basin of South America. This basin encompasses seven million square kilometers (1.7 billion acres), of which five and a half million square kilometers (1.4 billion acres) are covered by the rainforest. The Amazon represents over half of the planet’s remaining rainforests, and it comprises the largest and most species-rich tract of tropical rainforest in the world. Yosemite National Park is a national park spanning eastern portions of Tuolumne, Mariposa and Madera counties in east central California, United States. The park contains five major vegetation zones: chaparral/oak woodland, lower montane, upper montane, subalpine, and alpine. Of California’s 7,000 plant species, about 50% occur in the Sierra Nevada and more than 20% within Yosemite. The alpine Swiss National Park is located in the canton of Graubünden in the east of Switzerland between Zernez, S-chanf, Scuol and the Fuorn Pass in the Engadin valley on the border with Italy. It has an area of 174.2 km² and is the largest protected area of the country. It was founded on 1 August 1914, the national holiday of Switzerland. It was one of the earliest national parks in Europe. The Plitvice Lakes is a national park in Croatia in the Plitvice Lakes municipality, in the mountainous region of Lika. The Plitvice Lakes national park is heavily forested, mainly with beech, spruce, and fir trees, and features a mixture of Alpine and Mediterranean vegetation. It has a notably wide variety of plant communities, due to its range of microclimates, differing soils and varying levels of altitude.